Aluminum is a type of ubiquitously existing naturally and widely used metal in our world. It is combined with other elements and forms different compounds. In different pH and due to other conditions, it can be released into ions of different valence states. Our century is an “aluminum age”; aluminum is used in many fields of our daily life, such as vaccine adjuvant, antacids, food additives, skin care products, cosmetics, and cooking wares, and may be as elements or contaminants appeared in a lot of foods, including infant formulae, milk products, juice, wine, sea foods, and tea. It also appears in drinking water due to the water treatment process, or naturally coming from weathering rocks and soils, or released from rocks and soils caused by pollution-induced acid rain. Due to good physical and chemical property, aluminum is being tremendously utilized in many industries. In a lot of production and process procedures, aluminum particulates are seriously exposed by workers. Many factors, such as silicon, citrate, iron, calcium, fluoride, etc., can affect absorption of aluminum in human body. Human being ingests aluminum through the respiratory and digestive system and skin. Aluminum can affect our health, especially impair central nervous system. 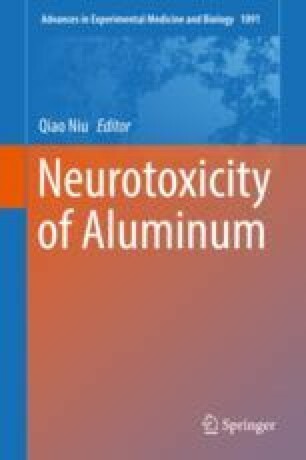 The important damage is cognitive impairment in Al-exposed peoples, Alzheimer’s disease and other neurodegenerative disorders have been related with aluminum exposure, and aluminum has been proposed as etiology.